When it's cold and dark outside, sometimes there's no better place to be than the pub, and Sheffield isn't in short supply. The city centre is home to some fantastic bars, but during the winter, it's the 'proper pubs' that are often the most cosy. Here are some suggestions for if you're in need of a traditional pub to spend an evening in Sheffield after 5pm. Thornbridge Brewery’s hidden gem The Bath Hotel can be found just off West Street on Victoria Street. The bar is stocked with the brewery’s award-winning beets in cask, keg and bottle, with frequent guest beers from around Britain and the world in rotation. From 5pm on a Friday enjoy hot roast pork sandwiches, on other evenings, treat yourself to a pork pie or sausage roll. With folk nights every Wednesday, quiz night every Thursday, and jazz and poetry twice a month, The Bath is a great spot for enjoy the simple things – great beer and relaxing with friends. A cosy boozer on Pitt Street, just behind West Street, the Red Deer serves great beer and increasingly has a fantastic reputation for vegan beers and food. As well as eight real ales – five of which are guest, and always rotating – the Red Deer has two vegan ales on the bar, and a full menu dedicated to veggie and vegan food. Enjoy a themed quiz every Tuesday, and regular live music and poetry nights throughout the month. Made famous by Pete McKee’s The Snog mural, there has been a pub on Fagan’s Broad Lane sight since the 1800s, and if it’s a traditional pub you’re after, Fagan’s is perfect. Things are kept simple – good beer, good food and a homey atmosphere. Fagan’s often has live music, and is always full of regulars, pop in once and you may just become one yourself. Outside of Sheffield, The Grapes may only be known as the venue where the Arctic Monkeys played some of their earliest gigs, but talk to any pub fan in the Steel City and they’ll tell you there’s much more to it than that. With traditional Irish music most nights, and a love for Guinness, The Grapes prides itself on being a ‘proper pub’ and boasts traditional décor, some great ales on the bar, and of course, will always have a place in Sheffield’s musical heritage. 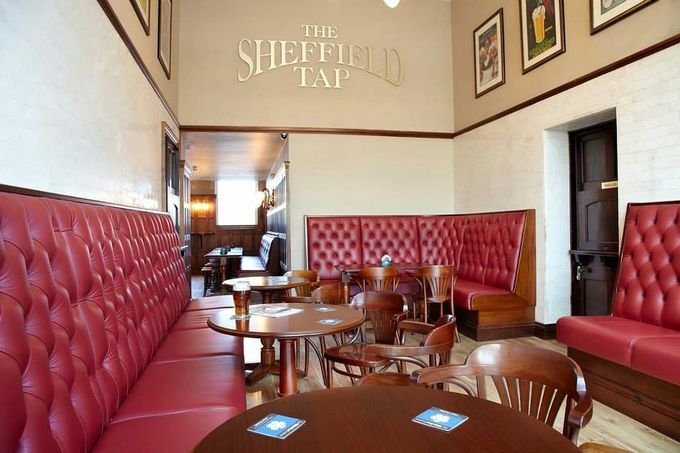 The Sheffield Tap is Sheffield train station’s resident pub and brewery. Though the pub itself is huge, but there are plenty of snugs to get cosy in. Beer is king at the Tap, with brews sourced from around the world. With two beer fanatics at the helm, The Rutland Arms on Brown Street attracts beer fans from across the city, and it’s often standing room only on an evening. With seven hand pumps, two real cider and a fantastic selection of gins, rums, and whiskeys, The Rutland is a great spot for a post-work drink. With regular meet the brewer events, tasting evenings and the occasional comedy night, it’s worth keeping at eye on The Rutland’s Facebook page for the latest events.